Woke up this morning to an Annabelle scare. Well, to be more specific, I woke up to a sleeping baby, and that made me EXCITED! I got up, got all my other 3 kiddos ready for the day, did a few things, and Annabelle was STILL sleeping. I finally woke up her up at 9:30. She’d gone to bed a little late the night before so I blamed it on that. Upped her O2 from 1/4 liter to 1/2 liter, but it only made her come up to mid-eighties, so we had to go all the way up to 3/4 of a liter for her to even SAT low 90’s. But then her color was improving, so I breathed a bit better. Funny thing was, we tested it and moved her to the O2 tank vs the concentrator, on the same amount of oxygen, and her sats shot up to high 98! So going to call the medical supply company and see if there is something we should check to make sure the concentrator is working right. I can see a little difference… but that is a BIG one. But…. I’d promised Kara and Lacy to take them out today. I was REALLY nervous doing so, but Annabelle was stable and doing better on more oxygen, and Scott was here, so we ventured out around noon. What did we do, you might ask? Well, a few months ago I’d agreed that they could get their ears pierced. I told them they had to wait until Annabelle was home because they would need my help keeping them clean etc. So… I finally made good on my promise. 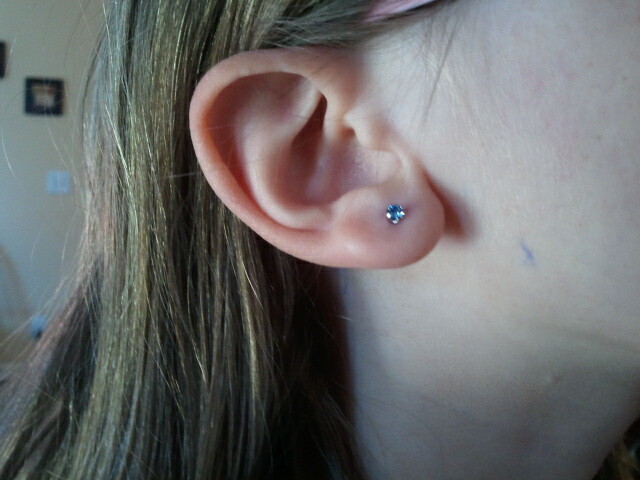 I know have two little girls with cute little ears pierced! And… with my husband’s prodding, I did my own too. I’d let them grow back years ago because they were always bothering me. Trying again with 4 kiddos… yeah I might be dumb, but the girls wanted me to go first! HA! I do have to brag on them though. They did GREAT! Not one tear!!!! We grabbed a shake from Steak N’ Shake (half price happy-hour! ), picked up a few groceries, then headed back home. And home brought us an awake and happy Annabelle! 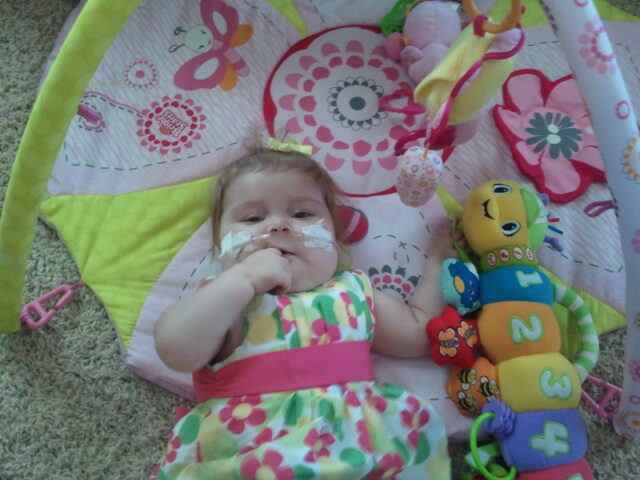 She’s still on a high setting of oxygen, but I can tell she’s feeling much better, playing with her toys (and her toes!!!) and MUCH less cranky! THANK YOU everyone for sharing your dreams! I LOVED reading them!!! While reading them, I realized that I think I tend to have two seperate catagories of dreams. I have my regular ole dreams…. I want to be a writer, I always wanted to be married and be a good Momma, someday I’d love to go back to school and get my degree in… something. I have a whole long list of things… maybe the equavalent of some people’s bucket list, but not that specific (or daredevilish!). But then I have my hopes. They are dreams too, but much more important ones! My hope is that my kids will all know Jesus personally and will grow to be women of God that serve him. My hope is that Annabelle will overcome her heart condition and will be a shining light for Jesus even though her life will be just a little different than others. My hope is that my husband and I can have an excellent marriage and will be a wonderful example for my girls in their future marriages. I have a ton of people on my “hope” list that I hope and pray come to know Jesus intimately. I could go on for a long time on this list too, but you’d get tired of reading pretty soon I’m sure! For those who are “living” your dreams… CONGRATS!!!! I’m living many of mine too!!! And I owe it all to a wonderful Savior and Lord who has blessed me beyond my wildest dreams. Your continued prayers for Annabelle are appreciated. Clinic visit is tomorrow, so we’ll be talking about her oxygen issue I am sure, and having some more discussions about her electrolyte levels. Annabelle got dressed up for a “special” unnamed visitor today!!! She’s playing with her caterpillar here. Lacy’s pretty earrings! They each got their birthstone… I got my “anniversary” stone as I liked it better! Concentrater may need to be higher than a tank…tank is 100% and concentrater is at best (new and perfectly clean filters) 80%…Leyda is on 3litres…at hospital she can by on 2.5litres. Sorry about the scare! Praying for Annabelle… and for her mommy to get some rest! I took my girls for ear-piercings a few years ago and it was so fun! Recently my 14 year old got a second piercing in one ear. Another milestone. Enjoy! Beverly… RT guy says that it is usually 93-95%. Who knows! I just know it was fine before… now it's not. We're up to a liter now and I just want to stomp my feet and yell at someone (not really sure who… HA!) Will probably head in early tomorrow to clinic just to make sure things are still okay. *sigh* Praying for Leyda… *hugs* You are one tough Momma!!! Rachelle, THANKS! Yes, fun milestones!!! Gotta love girls:-) I'd let one of them get theirs pierced a few years ago, but she refused to clean them good and they got infected so out they came! Hoping for better luck this time!!! Yikes, that was a scare. But I'm so glad Annabelle is doing better! Those earrings look so cute!! I had my ears pierced years and years ago and they just swelled like small cauliflowers, LOL. So I stopped using the piercings. I hope you had a great clinic visit today! Still praying. Hope the clinic visit went well.